we want smaller, lighter and longer-lasting bearings. Robots are becoming an essential part of our lives in the form of robot arms used in manufacturing, humanoid robots for households and so on. As such, they are being required to achieve more complex and precise movements. Such high-accuracy movement in a confined space is achieved by high-spec robot parts. The robot parts manufacturer introduced in this case study had taken on the challenge of developing cutting-edge parts in the robot market, which can be accurately described as the ultimate form of machining technology. In order to accomplish this challenge, the bearing, one elemental part, was required to be of ultra-high quality and be smaller, lighter and longer-lasting. JTEKT, the bearer of the Koyo brand, put its hand up for the development of such a bearing as a manufacturer skilled in special domains. Completion of a bearing 50% thinner and 1.3 times longer-lasting than conventional bearings! Contributing to the development of robot parts that are compact, lightweight and long-life. By revising the conventional manufacturing method, JTEKT newly developed the Ultra Thin Deep Groove Ball Bearing which achieved the conflicting performances of small size and high capacity (long life). Approx. 50% thinner bearing ring compared with a conventional bearing (68 series). The bearing outside diameter has been reduced to 90%. Approx. 50% increased ball replenishment rate compared with a conventional bearing (68 series). Through this, it was possible to improve dynamic load rating by 10%, static load rating by 30% and life by around 1.3 times that of a conventional bearing. The development of this new bearing leveraged know-how accumulated through production of the conventional 68 and 69 series. To make the bearing more compact, we improved methods for securing parts during lathe turning and grinding, and made the bearing raceway even thinner. Furthermore, in order to prevent droop and distortion that comes with thinning, we established the optimal heat treatment conditions and measurement method. Thickness is around half of the 68 series, and bearing outside diameter has been reduced to 90%. To achieve high capacity (long life) we distorted the bearing ring using a special-purpose fixture, to increase the ball replenishment rate more than 50% than that of the 68 series. Load capacity was improved, achieving a high capacity (long life) more than 1.3 times that of the conventional bearing. The Ultra Thin Deep Groove Bearing is mass produced by Daibea, a company in the JTEKT Group, and is already adopted in many robot products. 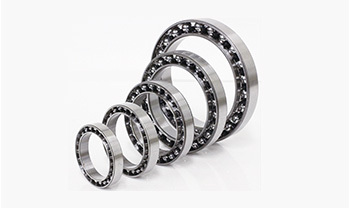 New bearings are born from responding to our customers' high demands. JTEKT was able to conceive the Ultra Thin Deep Groove Bearing specifically due to the customer's strong will to make state-of-the-art robot parts and the strong demand they made of us. I feel great pride towards our engineering divisions, who completed this development in a significantly shorter span than normal in order to meet the customer's needs. Please consult with JTEKT if you need an unprecedented bearing in order to make new products. I am sure JTEKT can meet your demands. In contrast to conventional bearings, this bearing is thinner and has an improved load capacity through an increase in rolling elements. This is a bearing that simultaneously achieves the conflicting properties of being small and high capacity (long life).